Available on Amazon, published by Sand Hill Review Press. With my planned historical fiction novel based on my family’s immigrant history in the research stage, I decided it was time to return to my Jewish roots for story themes. 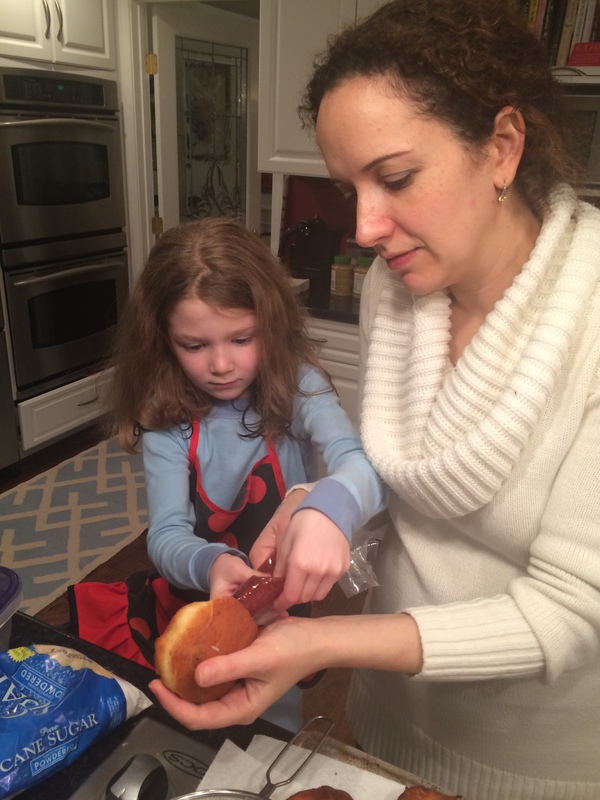 Rina helping Mama make homemade Sufganiot, the traditional Hanukkah jelly-filled donuts. 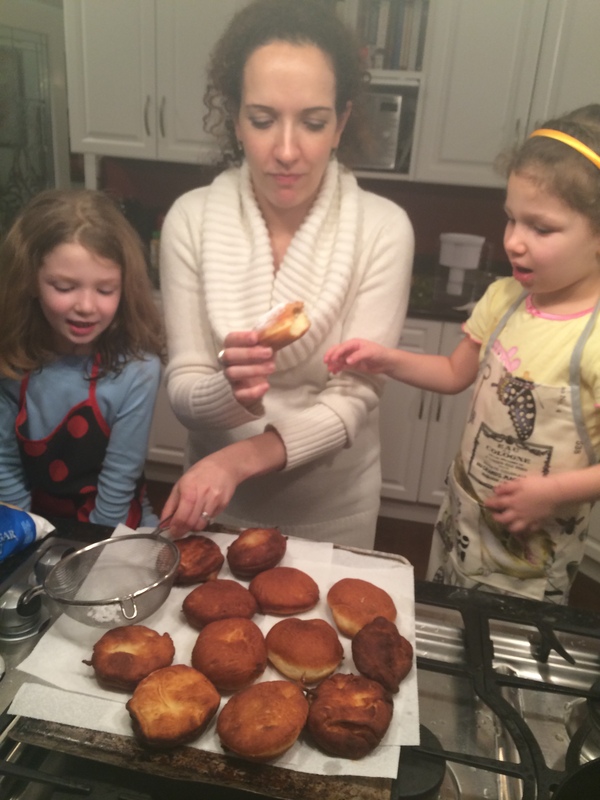 Rina with little sister Gabriella and Mama – Sufganiot ready for dessert. I wrote “Pierced Ears” to work through my anxiety over how the gruesome details of the Holocaust might be broken to a child, especially a Jewish child. In my own experience, I recalled that at just Rina’s age, a new girl entered my class in West Los Angeles, where I grew up in the 1950s. She had been born in Europe following the Holocaust. I knew nothing of this. Only a few years later was I able to make a connection to the events of (then) recent history. In the 2nd grade, I knew only that she was different from the other children in my class, and that each of her ears held—uniquely, in my experience—a beautiful, shiny earring. Years later, in fifth grade, Temple Emanuel religious school (“Sunday school”) screened the newly-released film, “Judgment at Nuremburg” about the trials and convictions of Nazis. And we learned in a unit devoted to the Holocaust to better understand and cope with the photographs of the concentration camps liberated by American soldiers. Rina and Gabriella inspire me every day! But it was a few days after I had submitted my story to Fault Zone: Diverge that I thought to ferret out my Castle Heights Elementary yearbooks and on the Internet for the little girl who inspired this particular story. It turned out that her lifetime of dedication to Holocaust survivors as an activist, volunteer, therapist, and advocate before the House of Representatives, has kept her in the news and all over the Internet. Someday, I may be brave enough to send her my story. Meanwhile, I dedicate my work, including the forthcoming work on Jewish themes, to Klara Firestone. With many fabrications wrought by storytelling exigencies and the half-century gone by, Klara was the little girl with the pierced ears. Read the story first, please, then read below about this remarkable individual, all grown up. Klara was born in Prague, Czechoslovakia, after the end of World War II, to two Holocaust survivor parents. She came to the United States as an infant and was raised in West Los Angeles. Following in her mother’s footsteps, she began her volunteer career in her early twenties in the pediatric department of Los Angeles County General Hospital. Later, she served as a Court Appointed Special Advocate (CASA) in dependency court, working on behalf of children under the protective custody of the court. In 1978 she was asked by Rabbi Abraham Cooper, Associate Dean of the Simon Wiesenthal Center / Museum of Tolerance, to begin a group for children of Holocaust survivors, thus becoming the founder and first president of Second Generation of Los Angeles. She has been serving for the past 15 years in her second term as president of the organization. In addition to her work with Second Generation, she has been involved with the Simon Wiesenthal Center/Museum of Tolerance, was an interviewer for Steven Spielberg’s Survivors of the Shoah Visual History Foundation, she represented the second generation as a Board member of the Council of Post-War Holocaust Organizations, and currently sits on the Board of the Los Angeles Museum of the Holocaust, chairing its Education Committee. In 2003, she was honored, along with her mother, for their work in the Holocaust community, by receiving the first Bessie Gotsfeld Humanitarian Award of AMIT Los Angeles Council. In 2005, she was honored by the Children’s Scholarship Fund (Rabbi Sholem Perl) for “Support in Rebuilding the Jewish People,” as well as being recognized by The 1939 Club at their Gala for her work in the Holocaust community. In 2010 she was honored by SHARE!, the Self Help and Recovery Exchange of the County of Los Angeles, with their Frances E. Jemmot Award for her work providing support groups for children of survivors. In 2012 Klara received a special recognition award at the Jewish National Fund’s Tree of Life Gala for her service to the Holocaust survivor community. Finally, Klara has been a guest lecturer on the Holocaust at various organizations, synagogues and schools, and was a featured speaker at the 2004 City of Los Angeles’ annual Holocaust commemoration. Professionally, she was a legal secretary and paralegal for 31 years before deciding to change careers. After returning to graduate school, Klara received her Masters degree in clinical psychology, and is currently completing her hours for licensure as a Marriage and Family Therapist. She specializes in treating two unique populations . . . the Second Generation (children of Holocaust survivors) and transgender individuals. This entry was posted in Uncategorized and tagged children, Fault Zone: Diverge, Hanukkah, Holocaust. Bookmark the permalink. Thanks, Elise, for sharing the inspiration behind “Pierced Ears.” It stands on its own, of course, but the back story makes it all the more powerful. Thanks, Audrey. As you can see, since it took me so long to reply to this, I struggle between wanting to write fiction and keeping up with blogs, my own and everyone else’s. Ah, the trials and joys of having so many excellent writers as friends. Your stuffing recipe is now in my recipe file. My son once dated a vegetarian for nearly a year. I rejoiced when they broke up, and danced with an extra skip in my step when he married Katherine, who eats all manner of meat, treif and truffles. Elise, I was touched by your story “Pierced Ears,” and it’s moving to read more about it here. 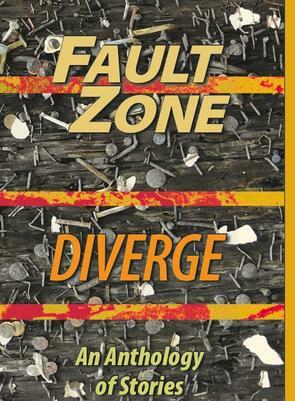 I’m glad you wrote the story and glad to see it’s in “Fault Zone” where it can be shared with many. Thanks, Darlene. This story is fiction, yet every story has a grain of truth, in this case, unfortunately. I would only find it appropriate to put “Pierced Ears” in a publication as deliberately tottering on the “edge” as our liberating Fault Zone.